This year's MacArthur fellowships — also known as "genius grants" — were announced this morning, and among the winners are two African-American scholars doing groundbreaking work on issues of race in America. 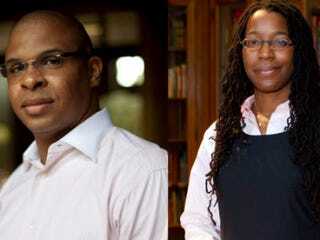 Roland Fryer and Tiya Miles are both university professors whose studies deal with complex questions involving race as it relates to their disciplines. Each of them will receive a stipend of $500,000, paid over five years, for the advancement of their work. The grants, which are awarded by the John D. and Catherine T. MacArthur Foundation, are designed to reward individuals in a wide variety of disciplines who have shown "extraordinary originality and dedication in their creative pursuits and a marked capacity for self-direction." Fellows, who don't apply but receive a surprise phone call informing them of the honor, are chosen for their past achievements and potential for future contributions. Fryer, a 34-year-old professor of economics at Harvard, researches the causes of economic disparity due to race and inequality. He's currently focused on analyzing educational data to predict the quality of life that children will have as adults based on test scores. Fryer says the data can be used to make critical changes to education and close the achievement gap. A few years ago, he published a study that found that children with "distinctively black" names fared no worse than other children on several socioeconomic measures, after controlling for circumstances at birth. Another examined whether paying students was an effective way to get them to improve their grades. Miles, 41, is a history professor at the University of Michigan whose work focuses on the relationship between African and Cherokee people living and working in Colonial America. She's already published two books on the subject: Ties That Bind: The Story of an Afro-Cherokee Family in Slavery and Freedom in 2005 and The House on Diamond Hill: A Cherokee Plantation Story in 2010. These two may have just been recognized for their genius, but they've been doing brilliant and important work for years. We can't wait to see what they'll produce in the future with the support of their well-deserved awards. Read more at BET News and NPR. In other news: VIDEO: African Fashion Gets a Place to Shine.